Aquila chrysaetos belongs to the raptor family, which is a top predator in the food chain. They mainly compete with other raptor species and top predators for lower species on the food chain. The only predator the Golden Eagles have are humans and only indirect competition for land resources. The Eagles have an extensive list of prey ranging from turtles to reindeer. This raptor is primarily responsible for controlling small bird and mammal populations such as owls, cranes, grouse, hedgehogs, marmot, hare, fox, as well as others in lightly wooded habitats (Sergio and Pedrini, 2010, 2013). SEE HABITAT. These birds occupy a specific niche, but have also been known to take on much larger prey when the smaller prey is not available. The trained Golden Eagles used by falconers have even been known to target large prey like gazelle, deer, goats, reindeer, and even wolf pups. A falconer is someone who raises a predatory bird to hunt and bring back prey for a reward. The indigenous people almost exclusively train Golden Eagles in the Mongolian Mountains. SEE FACINATING FACTS for more information on this topic. As human influence expands further and further, humans have become the species that directly influences these birds most (Ellis et al., 1999). As humans have expanded their territory predatory birds, specifically the Golden Eagle, have been targeted for eradication. Since farms began to form, Golden Eagles have been responsible for not only livestock loss but also the loss of game in surrounding habitat that early settlers were dependent upon for survival. Humans directly competed with these birds, which is why they were initially labeled as pests. As pests, not only were these birds directly targeted by people, but indirectly as well. Since these birds occupy the top of the food chain, many of the lower level chemicals that build in species are amplified in these animals. In the 1960s and 1970s pesticides like DDT began to build up in Golden as well as, Bald Eagles, because of the exposure to their prey (Woodwell, 1967). This build up of pesticides caused weakening of the Eagle’s eggshells that resulted in a failure to hatch. Another leading cause in Aquila chrysaetos population loss is the expanding of heavily wooded forest into the lightly wooded areas. The economic downturn has caused the unproductive land in the alpine environment to be abandoned by farmers. After a few years of abandonment the thick forest and shrub begins to take over. This change in Alpine habitat from lightly wooded to heavily forested land is shrinking the Eagle’s hunting causing expanded cover for prey, and obstructions in diving lanes. Other areas of this Alpine region have been planted to prevent soil erosion. Still more of the region has been forested to lower the possibility of an avalanche. 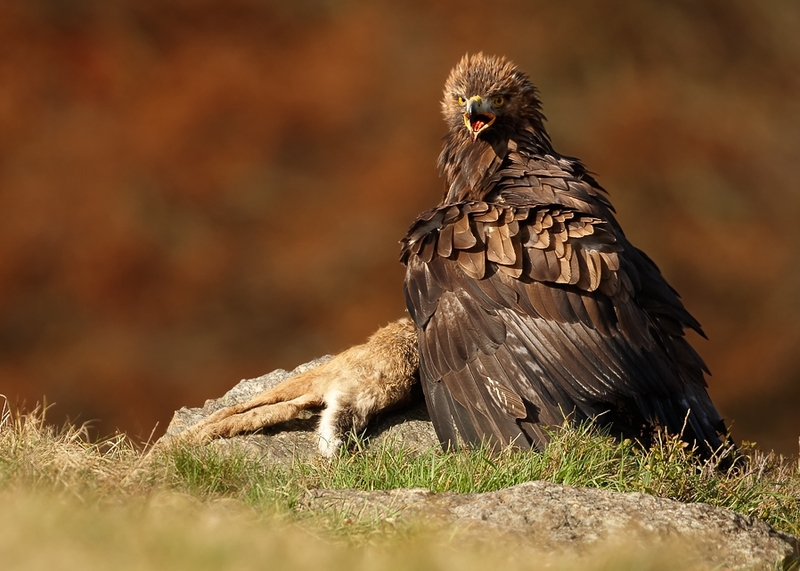 Although Aquila chrysaetos does not have any direct predators the increasing competitions has caused severe declines in Golden Eagle populations. According to the U.S. Fish and Wildlife Service, since 1962 three laws have been created to prohibit the disturbance, transporting, and sale of all Eagles and Eagle products. Many of Aquila chrysaetos interactions are due to their specific diet in their home ranges, visit the Habitat page to learn more. Return to Aquila chrysaetos homepage.